37. Know what to do if a bird gets into your house or garage. If you discover a bird in your house, take a deep breath. There’s no need for both of you to panic. First, close any doors to other rooms to keep the bird in a confined space. Close the shades and curtains and turn off any lights to make the room as dark as possible. If the room has a door to the outside, open it and slowly move behind the bird to guide it outside. If there is no exit, open a window from behind the still-closed curtain, then open the curtain, but keep any glass surfaces covered to keep the bird from hitting the glass. Slowly move behind the bird and guide it toward the open window. If no windows can be opened, keep the room darkened and try to toss a towel over the bird. Then you can pick it up and release it outdoors. If the bird perches in a high place and stays put, it’s often best to wait until dark. Then use a flashlight to find your way to the bird. In this case, if you still have the patience, it’s usually best to keep the bird in a cardboard box overnight and release it in the morning. If the bird is injured, bring it to a rehabilitator. Sometimes birds get trapped in garages. The most common situation is for a hummingbird to be attracted to the red emergency pull on an open garage door and then get confused. When birds are lost or disoriented, they tend to move to higher perches, where they are in less danger from predators and have a wider view. The best way to lure a hummingbird down is to set your most conspicuous hummingbird feeder as close to the open garage door as possible. If you don’t feed hummingbirds, put a red handkerchief or something else bright red near the door. 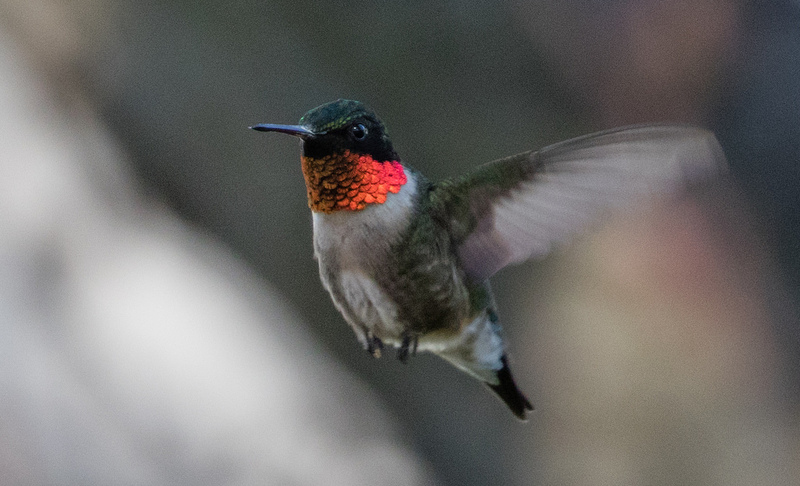 When the hummingbird comes down to investigate or feed, it will find its own way out.